Vacation rental villa. Sleeps 8, 4 bedrooms, 4.75 bathrooms. No pets allowed. Wake up to the sounds of the ocean and take a dip in your private pool before wandering down to the beautiful beachfront that beckons you below or just enjoy the dramatic ocean views from your private infinity pool. Perched along the sweeping hillside of Conejos Bay, this stunning villa features dramatic ocean views, vaulted ceilings, an open-air design, gourmet kitchen, and private infinity pool. Villa Marina is an oceanfront villa showcasing three master suites with king sized beds and a fourth bedroom with two single-sized beds; all with ensuite bathrooms. There are also 2 half-baths available in the common areas of the villa. Step out onto the terrace of the master bedroom and enjoy 270 degree views of pristine Oaxacan coastline from Montecito's south beach side. Two of the master suites are connected to the main villa via a short bridge way, a unique feature that creates a private sanctuary for guests! This gated beachfront community offers guests resort-style amenities including the incredible Cala Club; an elegant shared space complete with beachfront infinity pool, beachside dining, and access to Montecito’s private beachfront. The development also offers concierge-style service, a fitness facility, and an outdoor amphitheatre where renowned musicians and artist are frequently invited to showcase their work. 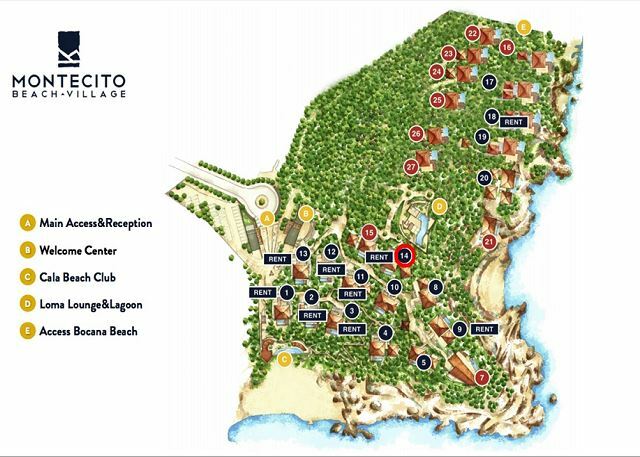 The property is located about a 20 minute drive from the Huatulco airport (HUX), along the main Boulevard Benito Juárez. At Montecito Beach Village you will enjoy the peaceful oceanside setting. The area is perfectly situated slightly away from the hustle and bustle of town, however access to any part of Huatulco is no more than a 15 minute drive (5 minutes to the resort district) and our team is here to help arrange taxis ($2-3 USD to resort district, $10 to downtown). Rooms Sleeps 8, 4 en-suite + 2 half bathrooms. Dear Mike, thank you for taking the time to share your experience at Montecito. Glad to know that even the second time in this exclusove community you stay in love with the beautiful accomodations and great amenities this beach village has to offer. I will be happy to see you one more time next year, take care! Regards, Cathy Bergamo & Your Friends at My Huatulco Vacation.